At a meeting in Washington last week, NASA and European Space Agency officials decided to first pursue a mission to study Jupiter and its four largest moons, and plan for another mission to visit Saturn's largest moon Titan, and Enceladus. The proposed projects are grand endeavors that set the stage for future planetary science research. These outer planet flagship missions could eventually answer questions about how our Solar System formed and whether habitability conditions exist elsewhere in the Solar System. Artist impression of the Laplace/EJSM mission. The missions, called the Europa Jupiter System Mission and the Titan Saturn System Mission, are the result of NASA and ESA merging their separate mission concepts. NASA originally studied four mission concepts during 2007, which were narrowed down to two proposals in 2008. One finalist was the Europa Orbiter to explore that icy moon of Jupiter and its subsurface water ocean. The other was a Titan Orbiter to visit the Saturn moon. Meanwhile, in 2007, ESA also initiated a competition to select their flagship mission for the Cosmic Vision 2015-2025 slot of the ESA scientific programme. Two finalists, called Laplace and Tandem, were selected for further study. Laplace was proposed as a set of spacecraft to orbit Jupiter and eventually orbit and possibly land on Europa. Tandem was proposed as a set of spacecraft to orbit Titan, explore its surface, after exploring the surface of Saturn's moon Enceladus. Artist impression of the TandEM/TSSM mission. NASA and ESA engineers and scientists carefully studied these missions in preparation for last week's meeting. Based on studies and stringent independent assessment reviews, the US Europa Jupiter System Mission, called Laplace in Europe, was the most technically feasible to do first. However, ESA's Solar System Working Group concluded the scientific merits of both missions could not be separated. The group declared, and NASA agreed, that both missions should move forward for further study and implementation. "The decision means a win-win situation for all parties involved," said Ed Weiler, associate administrator for NASA's Science Mission Directorate in Washington. "Although the Jupiter system mission has been chosen to proceed to an earlier flight opportunity, a Saturn system mission clearly remains a high priority for the science community." Both agencies will need to undertake several more steps and detailed studies before officially moving forward. "This joint endeavour is a wonderful new exploration challenge and will be a landmark of 21st Century planetary science," said David Southwood, ESA Director of Science and Robotic Exploration. "What I am especially sure of is that the cooperation across the Atlantic that we have had so far and we see in the future, between America and Europe, NASA and ESA, and in our respective science communities is absolutely right. Let's get to work." 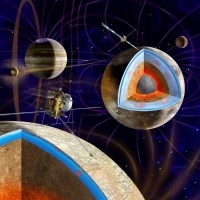 The Jupiter System Mission will use two robotic orbiters to conduct unprecedented detailed studies of the giant gaseous planet Jupiter and its moons Io, Europa, Ganymede and Callisto. NASA will build one spacecraft, which is initially named Jupiter Europa Orbiter. ESA will build the other spacecraft, initially named Jupiter Ganymede Orbiter. The two spacecraft are scheduled to launch in 2020 on two separate launch vehicles from different launch sites. They will reach the Jupiter system in 2026 and spend at least three years conducting research. Europa, with its putative ocean, is a unique target to study habitability around the gas giant. Ganymede, the largest moon in the Solar System, is the only moon known to have its own internally generated magnetic field and is also suspected to have a deep subsurface water ocean. Scientists long have sought to understand the causes of the magnetic field. Io, the most volcanically active body in the Solar System, and Callisto, whose surface is heavily cratered and ancient, providing a clear indication of a record of events from the early history of the Solar System, are also key targets of the Jupiter System Mission. The two orbiters will spend nearly a year orbiting Europa and Ganymede, respectively. They will both address, in synergy, Jupiter system science in order to better understand the formation and evolution of the Jovian system. The Titan Saturn System Mission would consist of a NASA orbiter and an ESA lander and research balloon. The complex mission possesses several technical challenges requiring significant study and technology development. NASA will continue studying and developing those technologies. The National Academy in Washington is beginning to piece together the plan that will be the roadmap for new NASA planetary missions to begin after 2013. On the European side, the interested community of scientists will have to re-submit the Titan mission at the next opportunity for mission proposals in the Cosmic Vision programme in the years to come. ESA's Directorate of Science and Robotic Exploration will manage the European contribution to the Jupiter mission. NASA's Jet Propulsion Laboratory in Pasadena, California, will manage NASA's contributions to the projects for NASA's Science Mission Directorate in Washington.